It’s only natural for you to have doubts whenever you come across claims that CBD oil is not addictive. After all, you may wonder, how can people not get addicted to something that makes them feel better, and treats symptoms of various medical conditions as well? Without getting into details, the answer to this involves a bit of medical explanation and research by prominent health institutions. So, if you’re concerned that you might develop an addiction to CBD oil, don’t be! To help ease your mind, here are some facts about CBD oil that will hopefully convince you that CBD oil is not addictive in nature. 1 How Do People Get Addicted to Something in the First Place? 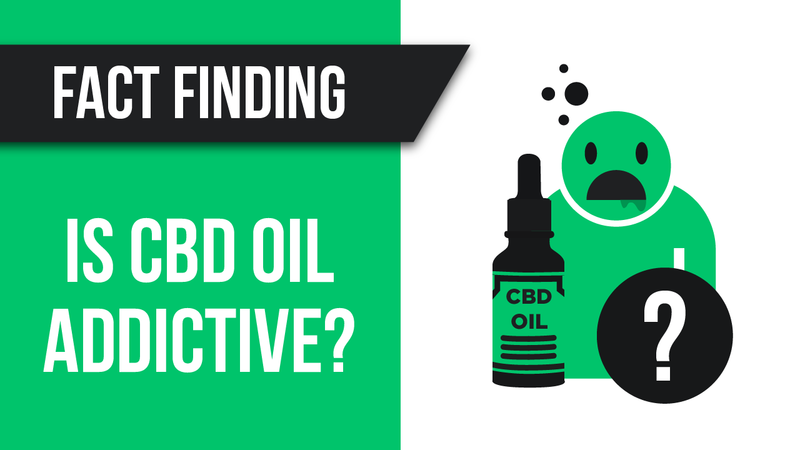 2 What Makes CBD Oil Different From Other Addictive Substances? 2.2 Should We Be Concerned About the Trace Amounts of THC in CBD Oil? 3.1 Is it Possible to Overdose or Take Too Much CBD? How Do People Get Addicted to Something in the First Place? I’m pretty sure all of us have become addicted to something during at least at one point in our lives. I guess what I’m trying to say is that anyone can develop an addiction. When we talk about addiction to medications and other substances, dependency develops when these substances activate the release of dopamine in what is said to be the pleasure centers of our brain. This chemical messenger plays a vital role in our brain and bodily functions. It is concerned with regulating our body movements, along with attention, memory, motivation, and reward. Once we stop using a substance, we experience what is called “withdrawal symptoms,” and we tend to take that substance again to combat these symptoms. It can be challenging to break away from this habit, even if we know the consequences involved. What Makes CBD Oil Different From Other Addictive Substances? To answer this, we have first to know what compounds are found in hemp CBD oil. CBD oil comes from cannabis plants, or more commonly known as hemp. A large percentage of the oil is made up of cannabidiol, or CBD. This and other cannabinoids are taken from the hemp, occur naturally and are non-psychoactive. When we say ‘non-psychoactive,’ it means we won’t get that “high” feeling. The hemp oil interacts with our systems in order to manage various symptoms associated with a number of medical conditions. It also helps in maintaining our overall wellness. Making a distinction between CBD oil and marijuana is important. Although they are both from the cannabis plant, they are taken from different varieties of the plant. CBD oil contains only trace amounts of THC, which is hardly the case in marijuana. In fact, CBD oil products from reputable companies don’t even reach the legal limit of 0.3% THC content. What this tells us is that it is unlikely for CBD oil to produce intoxicating effects. What’s more, experts have explained that CBD affects our endocannabinoid receptors located in our nervous system. These receptors are vital in maintaining our body’s homeostasis. Therefore, CBD oil almost never gives us side effects, and can even help our bodies sustain a healthy and normal state. It will balance our neurotransmitter levels, lowering and bringing them up as necessary. As for dopamine, CBD does not trigger its excessive release in our brains. It will not give us that “high” feeling, but will instead give us a feeling of calmness and relaxation unlike that experienced from taking opioids. If you’re also wondering, then CBD will not give you any withdrawal symptom. It’s also important to note that when you stop using CBD, there are no withdrawal symptoms. The World Health Organization (WHO) released a report that shows how CBD passed tests that determined if it has the potential for abuse. Volunteers were given CBD, and they were later evaluated using a series of tests. WHO declared that CBD oil is not addictive since the volunteers did not exhibit signs of potential abuse or dependence on CBD. This is good news for those who are still skeptical and are worried that CBD may be habit-forming in a detrimental way. Should We Be Concerned About the Trace Amounts of THC in CBD Oil? As I’ve mentioned, CBD oil may contain trace amounts of THC. However, this amount is almost negligible and highly unlikely an addiction risk. As a matter of fact, CBD prevents THC from binding with our cannabinoid receptors. This leads to a reduction in the effects that THC can cause. Because CBD is non-psychoactive and addicting, it can work as a panacea to keep cravings at bay. If you remember, we’ve already learned that CBD regulates the dopamine receptors in our bodies. Withdrawal symptoms also become less noticeable because of it. The Scripps Research Institute in San Diego did a study wherein it was discovered that CBD ignites our brain’s serotonin receptors. Rats were given cocaine and alcohol, and then they were given CBD oil afterward. Five months after, there were no traces of CBD in the rats’ systems, and that they still did not exhibit drug-seeking behaviors. With regards to smoking, CBD can also help in breaking the habit. The University of London did a study wherein the relationship between nicotine addiction and cannabinoids was observed. Smokers who were given a CBD inhaler instead of a placebo were shown to have a significant reduction in nicotine craving. This further reinforces the fact that CBD oil is not addictive. Is it Possible to Overdose or Take Too Much CBD? Even when consumed in high amounts, there has been no reported incident that you can overdose on CBD. It doesn’t interact with our brain receptors that control heart rate and breathing. If there are any, then CBD side effects are very minimal and minor. Most of the common side effects include low blood pressure, dry mouth, and drowsiness. So, do you still think CBD oil is addicting? Scientific research and testimonies all say it is not. At most, you will just notice the return of the symptoms of your medical condition once you stop taking your CBD dosage. I hope your worries were put to rest, and you were enlightened as to why CBD oil is not addicting even if it provides relief and wellness to people struggling with medical conditions.